The Malonga Casquelourd Center for the Arts was alive with movement and music as the Oakland Ballet Company presented three performances of “Oakland-esque”, their spring production. In this two-act program, the cast and audience took a chronological journey beginning in the late 1920s and culminating in the present day. Inspired by these past nine decades, four world premieres by four different choreographers offered stylistic breadth and range of genre. Though at their core, each piece was committed to “Oakland-esque’s” larger narrative: the strength of community spirit. Opening the evening was the world premiere of Sonya Delwaide’s “Rocky Road”. A contemporary work for the company, along with guest artists Sonsherée Giles and Joel Brown of AXIS Dance Company, “Rocky Road” traveled back in time to the 1920s and 1930s (incidentally, the audience learned at the end of the dance that Rocky Road ice cream was invented in Oakland back in 1929). Narratively, “Rocky Road” featured a varied community leaning into their existing reality. And structurally, Delwaide peppered the work with movement from the chosen era but re-imagined for a contemporary audience. Flexed feet, Charleston partnering and parallel boureés abounded. Act I’s second world premiere was Robert Moses’ “TIP”, a contemporary ballet set to music by Larry Graham and Graham Central Station. Again, community and youth culture took focus but this time, Moses centered the action at a 1960s/1970s beach party. Full of unexpected partnering and surprising choreographic moments, the entire Oakland Ballet ensemble was ‘all in’ for this dance. Though with any Moses piece, the key to effective communication lies in the transitions, which needed further attention here. It is in these quieter, in between moments that the mystery, excitement and drama of the movement can be fully revealed. The company was not quite there yet. And while these first two world premieres were a great start to the celebratory evening of dance, there were sound problems from time to time. The recorded scores in both works had several instances of overly piercing and even grating levels. 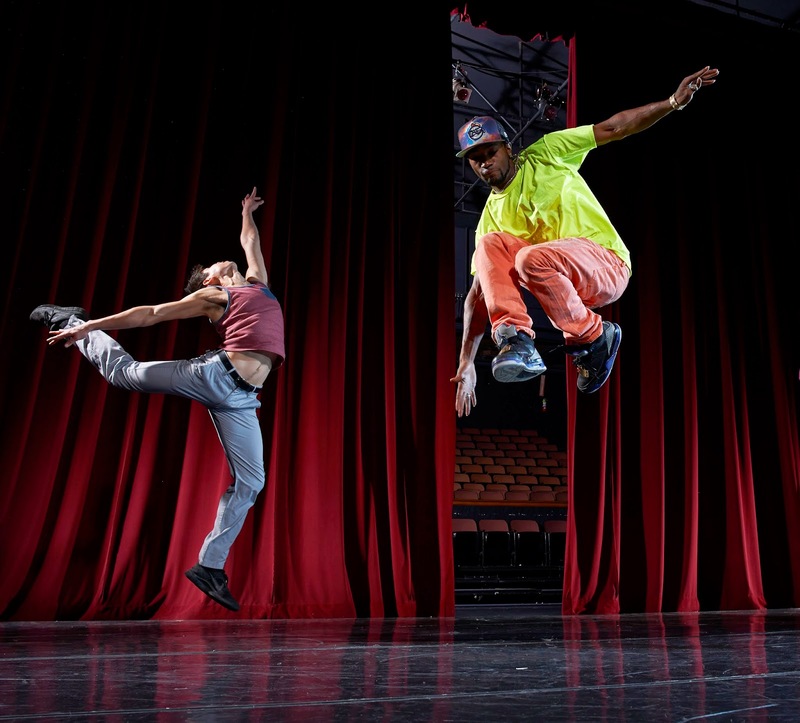 forward to present day and “Turfland”, the highly anticipated premiere by company Artistic Director Graham Lustig that closed the “Oakland-esque” program. Guest dancers from the Turffeinz joined the Oakland Ballet Company in a complete celebration of motion – street dancers partnered ballerinas, classical dancers broke into b-boy sequences, there was even a moonwalk on pointe shoes. Different members of the cast took turns videoing the action, which was then projected on the back scrim in real-time, interspersed with a collection of Oakland-inspired murals. The whole stage percolated with movement, joy and energy; and the vitality was contagious - the audience was completely caught up in it. While community was woven throughout the entire night, Lustig’s “Turfland” was the ultimate expression of community. Yes, there were different dance styles and movement genres onstage together, but the work was much more than that. It was a meeting of artists; a collaborative conversation; and most definitely, a tribute to Oakland.